CooksRecipes has quality, kitchen-tested recipes for a variety of orange pies that you can count on for successful deliciousness. 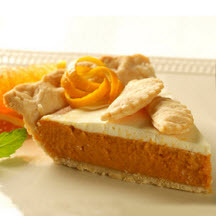 This pumpkin pie is infused with orange juice concentrate and orange peel, and crowned with a sour cream topping. Serve with spiced apple cider on a chilly afternoon.